It was love at first sight when I first laid eyes on The Dairy. I’d been paying a visit to the MERL on Upper Redlands Road earlier in the day and I’d dimly remembered that The Dairy, one of the bars which was part of the University, was just down the road. I’d never been, so in the spirit of adventure I did a bit of research, checking out the sadly departed Matt Farrall’s excellent article on the subject for the Whitley Pump). Later that week, I dropped in for a drink. When I got there, I was thoroughly charmed. It took a bit of finding – it’s pretty much completely unsignposted, and you access it by going up a ramp only to find an unadorned door with a simple plaque next to it saying “The Dairy” in a plain, municipal-looking font. Once I got there, though, I liked the look of the place: it’s made up of two big rooms with clean, white walls, sizeable tables (high ones in the main room, lower ones in the back room), comfy furniture and a wide array of decent beers on keg, including four different craft lagers and representatives from many of our local breweries: Siren Craft, Wild Weather and Elusive, not to mention other breweries like New Wharf and XT. It’s a university bar, but it was open to the public and seemed to have a pretty varied clientele. Not only that, but even without a student discount you could get a pint of good, well-kept craft beer for around three pounds fifty. 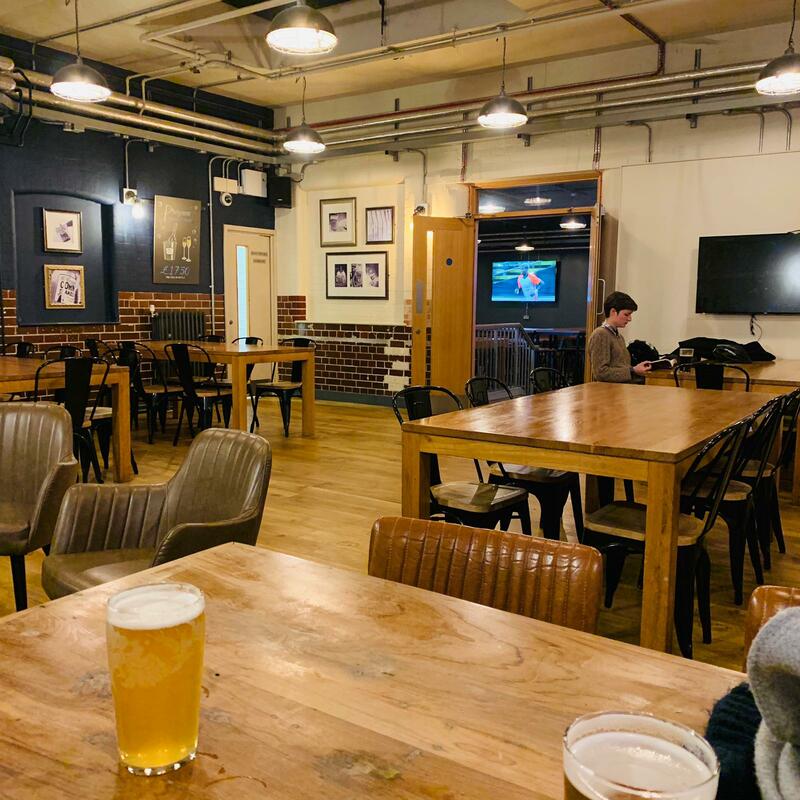 I found myself making a mental note that this could make a great place for board games nights with friends, or for a quiet pint on the evenings when I fancied a change of scenery from my usual haunts (it was sleepy on a week night at the start of term). Then I spotted the menu. Now, normally I would never have considered The Dairy as a venue for a food review, but there were lots of interesting touches on the menu which made me wonder. 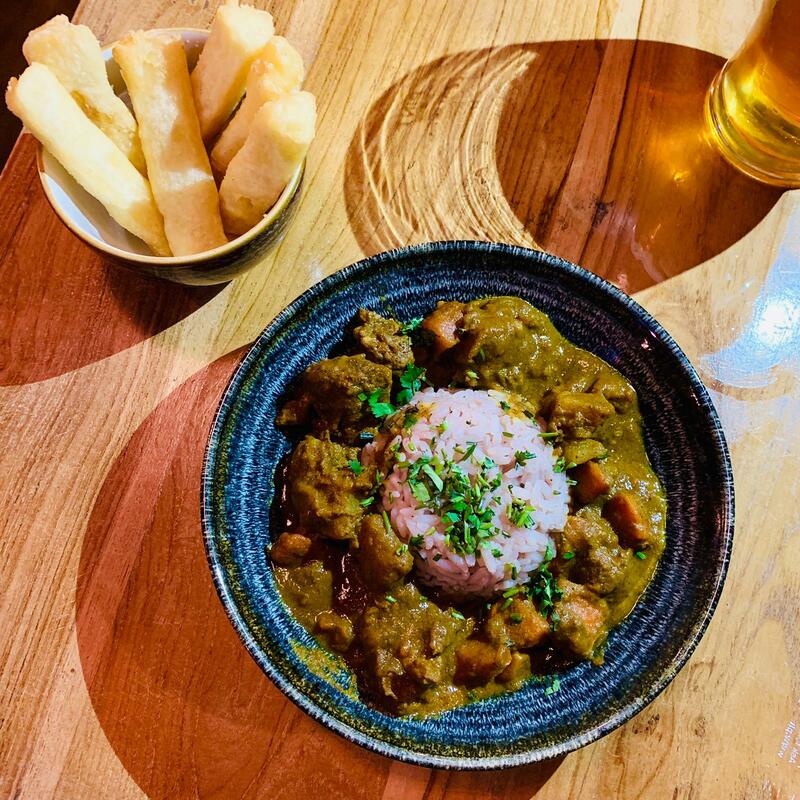 Jerk chicken, curry mutton and Jamaican vegetable stew all looked different from the usual fare and even the burgers, complete with a very now charcoal brioche, seemed slightly out of the ordinary. I took a picture of the menu and resolved to come back to see if this could be the kind of hidden find which always lifts my spirits. Returning on a Saturday evening with my partner in crime Zoë, The Dairy was much more obviously a student bar and was far busier. I felt a tad decrepit grabbing a stool at one of the high tables, and then swapping it for one better equipped to support my child-bearing hips. That feeling wasn’t helped by looking around to see hordes of young people watching the big screens, playing pool, eating all-day breakfasts (not something on the menu I had ever considered ordering, in all honesty, and especially not at eight o’clock at night) and generally not appreciating that they were slap bang in the middle of the best years of their lives. I wandered into the back room to see if any tables were available there, but was greeted by such a wall of noise that I thought better of it. I did spot one gentleman at another table who was even older than me, and that reassured me enough to grab a menu. Broadly speaking it divided into two sections (unless you count a very small selection of starters and salads and – of course – that all day breakfast): world food and burgers. We quickly decided to try one of each and I went up to the bar to place the order. None of the dishes costs more than a tenner and once you hand over your card (the whole place is cashless) they give you a little gadget which buzzes when your food is ready, signalling for you to go and pick it up from the hatch. Easy peasy. The first warning bell rang when the gadget buzzed, no more than ten minutes after placing my order; that felt quick enough that I wondered whether a microwave had been involved. I approached the hatch to find the food had been set down in front of me, but with nobody on the other side to greet me. The shelves behind were full of stuff from Brakes, another disconcerting sign. I would have just taken the dishes and gone back to the table but one of them, the mutton curry, was missing the advertised naan bread and mango chutney. Instead there was a small bowl of what appeared to be giant, wan-looking chips, stood upright. I waited, but nobody appeared, so I said “excuse me” as loudly as I dared and a lady wandered in from what I assume was the kitchen. “I’m sorry, but I’m waiting for a naan bread” I said, doing the English thing of apologising for expecting to receive what I had ordered. Never mind, I thought, carrying everything back to the table and picking up some cutlery from the bar. The mutton curry was Zoë’s, but I managed to try enough of it to dispel the rumour that it had been microwaved: surely it would have been hotter if that was the case. The meat was a tad chewy – not undercooked per se, but not enjoyable to eat and the spicing in it was probably best described as subtle. It was definitely luke-warm, though, and for nine pounds the portion felt a little on the mean side. I didn’t try the yuca fries (although I did google them to find out that they were made of cassava) but Zoe ate a few without any real enthusiasm. They looked like the kind of thing you might use to insulate a loft. “What do you reckon?” I asked. “It’s just not hot. To be honest, I’d rather go to Clay’s.” She had a point – I would far rather have spent a little more and had an infinitely better curry elsewhere. I had a feeling the list of places doing a better curry than The Dairy – and this in itself was pretty alarming – probably included Wetherspoon’s. Still, I’ll say this for the mutton curry: it wasn’t the chicken burger, which is an early front runner for the single worst thing I’ll eat in 2019 (let’s hope it bags that prize, because I don’t really want to think about what, if anything, could beat it into second place). The charcoal brioche was weirdly, cloyingly sweet. The bacon – back, cooked to miserable limpness – was indifferent and salty. 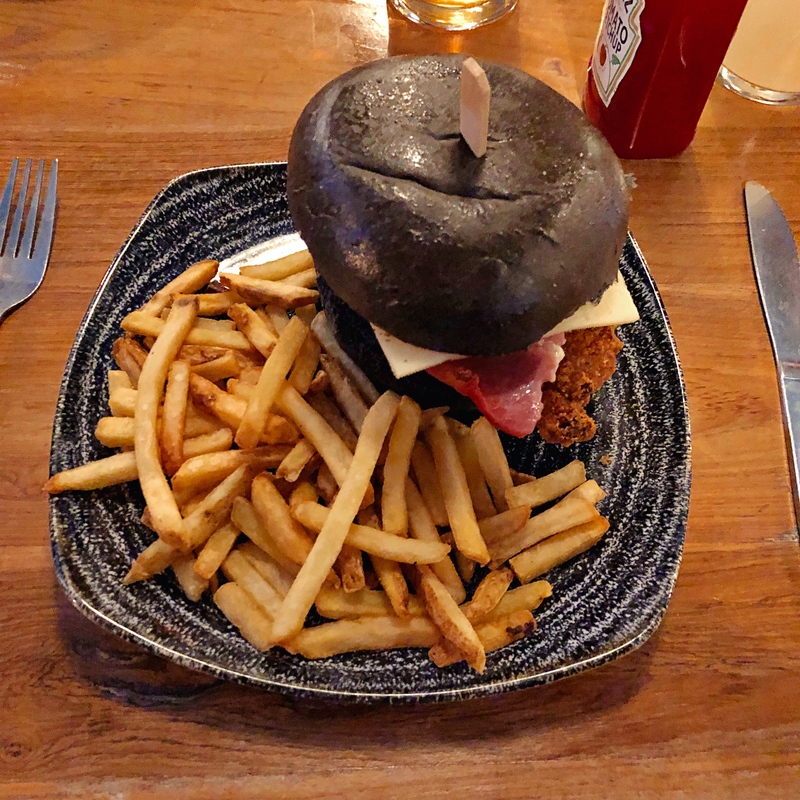 The burger itself was breaded and I’m not sure whether it was baked or fried but the coating had the texture of an asteroid with no discernible seasoning: the chicken, once you got to it, at least recognisably had started life as a fillet but after that it had been not so much cooked as mistreated. The thin slice of American cheese on top had been completely unmelted by the lukewarm contents of the brioche. I wasn’t sure how the kitchen had managed to overcook something, yet it still wasn’t hot: I wasn’t sure I wanted to know. The “barbecue glaze” underneath it had the sort of gloopy sweetness which gave me bad flashbacks. There was something odd about the taste of the fries: it could have been that they were tepid, it might have been that they were stale, it might have been something else altogether. Running through the possibilities in my mind started to bring on reflux. I left a fair amount of this dish, and most of the fries, and things have to be pretty bad before I do that. If the food had been good, there would have been more drinks. We would have checked out the dessert section of the menu and ordered the churros (“plain and caramel filled… served with butterscotch sauce”). But the food wasn’t good, and I needed to leave before I was completely put off The Dairy as a watering hole, and for that matter put off churros for life. The meal, along with a ginger beer and a very pleasant pint of Eisbar, a “Vienna style lager” by XT, came to just shy of twenty-two pounds. Service at the hatch had been pretty perfunctory, but the bar staff had been lovely and friendly (and one of them was very apologetic about it being her first shift). The whole thing seemed to reinforce my overall view, namely that The Dairy was a great place for a quiet drink but that nobody should consider eating there. As we left, I was torn between feeling a little queasy and really wanting to eat some chocolate, or at least something that didn’t taste of the chicken burger. In the end I thought better of it, but that burger sat uneasily with me for the rest of the evening. “I suppose the obvious comparison is the Oakford” Zoë had said while we were waiting for our food, before anticipation transmuted into disappointment, and I think in many ways she is right. For cheap, cheerful burgers, at least – although having done some research since the burgers at the Oakford are a little more expensive, mainly because fries are extra (though I don’t think anybody in their right mind would pay extra for The Dairy’s fries). But really, I couldn’t think of a good comparison: where else would the food have been quite so underwhelming? I don’t know whether The Dairy’s dishes do come from a Brakes lorry (from the section of the website marked “for students”, perhaps), and you could say that I should have known better than to expect great food from one of the university bars. All I can say is that I was taken in by the menu, but more to the point I wrongly thought that the pride The Dairy had put into its drinks offering would be matched by the food. So I do have a new favourite watering hole, along with a salutary lesson that even after over five years of doing this I remain more than capable of making the wrong call and picking a duffer. I still recommend going to The Dairy for a nice pint if you’re in the area (and the benches out the front might be lovely on a summer’s day). Just make sure you’ve eaten beforehand.